The latest numbers from research firm IDC reveal that the premium smartphone market continues to be a largely two-horse race between Samsung and Apple, which accounted for 21.7% and 14.1% market share in the second quarter respectively. The rival tech companies combined for 35.8% quarterly market share, finishing well ahead of emerging Chinese competitors Huawei, Xiaomi and Lenovo during the three-month period ending June 30. IDC's Worldwide Quarterly Mobile Phone Tracker shows that smartphone vendors shipped a total of 337.2 million smartphones worldwide in the second quarter, an 11.6% increase from the 302.1 million units shipped in the year-ago quarter. The growth was driven by not only premium devices sold by Apple and Samsung, but also the growing number of affordable handsets available in emerging countries such as China and India. Apple increased 2.4 percentage points to 14.1% during the second quarter compared to its 11.7% market share in the year-ago quarter, while market leader Samsung experienced a year-over-year decline as its market share slipped from 24.8% to 21.7%. Apple closed the gap on the continued strength of the iPhone 6 and iPhone 6 Plus, with the company announcing it sold 47.5 million iPhones in the third quarter of the fiscal year earlier this week. Apple and Samsung continue to dominate the smartphone operating system race, trailed by Huawei, Xiaomi and Lenovo with 8.9%, 5.3% and 4.8% market share in the second quarter respectively. 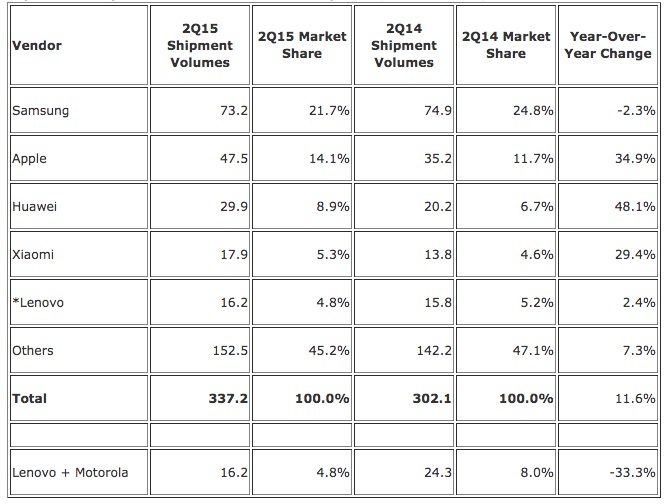 All other smartphone makers accounted for a combined 45.2% quarterly market share. Overall mobile phone shipments in the second quarter reached 464.6 million units worldwide. looks like samsung doing it right...for some odd reason. Samsung's shipment volume dropped 2.3% year-to-year, while apples went up 34.9%. Looks like Apple is the one doing it right. gotta love the spin. Rather than saying Apple trailed Samsung, the headline talks about their combined sales. Rather than saying that Apple trounced, I mean absolutely trounced Samsung in the profit department, and saying that Apple beat Samsung handily in revenue, they spin it by counting the number of phones, no matter what the price. You know what else is spin? Confusing "shipments" with "sales". Yep. Unless, like many on here, your own self-worth is dependent on what consumer electronics company you use. we need more players in this game to step up and even out the field. Sony, Nokia (Newkia)/Microsoft, LG, HTC, just off the top of my head. I love seeing Samsung drop, I will never forgive them for two years of torture I survived as an owner of Galaxy S III. Go Apple! Amazing how much Samsung's "innovation" depended on a larger screen. Plus we don't really know how many of Samsung's "shipments" turned into actual sales. What companies are in the "other" category? That's a huge percentage for other. I know LG is probably in there, and Blackberry (lol), but that's a lot of also-rans to make up almost half the market. Sony, Microsoft, ZTE, Sharp, NEC, Toshiba, Casio, Amazon, Gionee, Oppo, Oneplus, BLU, etc. You'd be surprised at how many companies are still trying to bet their futures on smartphones.